Eureka at Alberts - Sat 19th Jan! Eureka is our new Live band night at Nottingham’s freshest music venue, Alberts! – Expect a smattering of Indie rock, pop punk, blues and folk to keep you out longer than you really should have. Remember, if you drink on Thursday then work’s only going to be better on Friday morning. 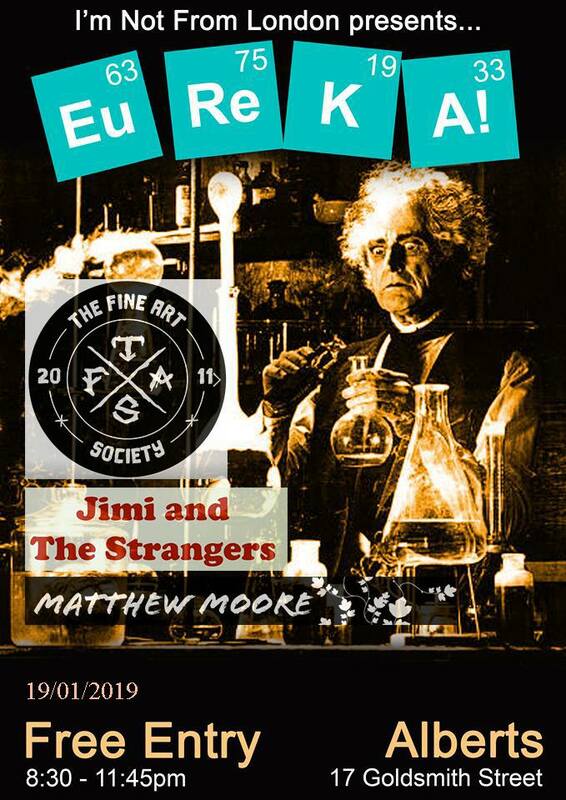 The Fine Art Society are a gang of art punks band consisting of three mates from Notts. Expect a frenetic, high octane pauerhausen of no nonsense mayhem. See them and die. Jimi and The Strangers is a new alternative rock band who harness the unique talents of various musicians from Nottingham and the UK. These fluid members form the ever changing band profile and composition of JTS. The band was formed by founding members James Mortimer and Lee Thomas back in 2014. Their music has been described as playfully poetic alternative rock by A&R factory, with one foot in country, the other in alternative rock, with a smattering of alt-folk, rhythm and blues. The band are working towards releasing their first album which is designed to launch the team’s film project. The film, How to Make A Hit Number One (draft title), is a comedic mockumentary charting the rise of the band as they embark on ‘specialist’ training, in the hope to make it big. The film is in the development phase and post script. The band members can often be found whiling away their down time on the veranda at Nottingham’s Broadway Cinema’s cafe bar.